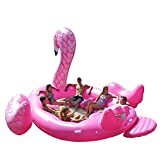 Take your obnoxiously large pool inflatables to the next level with this cool new Massive Inflatable Pink Flamingo. 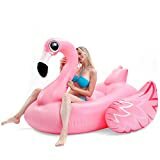 This gigantic inflatable pink flamingo will tower nearly 11 feet tall over your swimming pool (way funnier at the beach) while stretching out over 12 feet in length. It features triple air chambers and allows you to fill the base with water for extra stability. 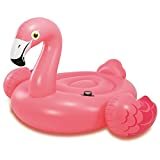 I can't even imagine trying to blow this up by mouth, so hopefully you have an air pump.